What Is Yellow Root Tea? 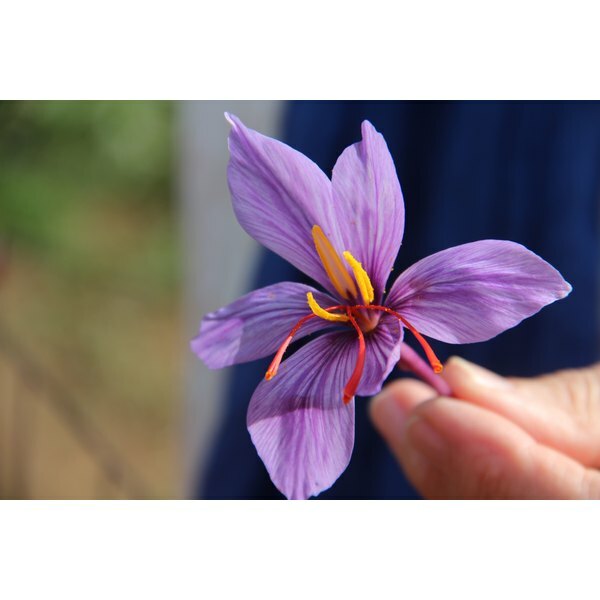 Saffron, also known as Crocus sativus, originated in the area spanning from Greece to Persia, now known as Iran. Saffron threads were traditionally used to dye cloth as a yellowish-orange color for the yellow-red color of robes for Hindu and Buddhist monks in India, Tibet and China, according to the Institute for Traditional Medicine. Iran is the world’s largest grower of saffron with an 85 percent share of the market, and Spain is the primary exporter. Saffron is known as the most expensive spice, reaching upwards of $5,000 a pound. However, the medicinal dosage is only approximately 30mg daily, making it much more affordable to the average consumer. According to a 2005 scientific study by Psychiatric Research Center in Tehran, Iran, published in the "Journal of Ethnopharmacology," saffron has comparable effectiveness to Prozac against depression. In the randomized, double-blind study, it was found that study participants who consumed 30mg of saffron extract daily for six weeks experienced significant alleviation of depression compared to those on the placebo. Saffron used for depression has no known side effects, and this is important because the main herb, St. John’s Wort, used for depression today, has a high potential for drug interactions, according to the Institute for Traditional Medicine. Saffron has long been considered an aphrodisiac. The specific effect of taking saffron, according to the "India Times," is that it makes erogenous zones even more sensitive. There has been limited research regarding the aphrodisiac application of the spice, but what is known is that it contains crocin, a carotenoid compound, which is known to play an important role in the sexual processes of algae. In a 2002 study of mice by the School of Pharmacy, Mashhad University of Medical Sciences in Tehran, Iran, published in "BMC Pharmacol," saffron exerts anti-inflammatory effects. The spice's application as an anti-inflammatory agent has been known for thousands of years. A research team from the KNH Centre for Biomedical Egyptology at The University of Manchester discovered the evidence in medical papyri written in 1500-1000 B.C. that indicated the Egyptians used saffron to treat inflammation, according to "Medical News Today." Based in Richmond, Va., Tara Carson has written articles for editorial and corporate online and print publications for more than 10 years. She has experience as an adjunct professor of nutrition at Northwest Christian University and holds a Bachelor of Science in journalism and nutrition from Virginia Commonwealth University. What Is Damiana Used for in Women?